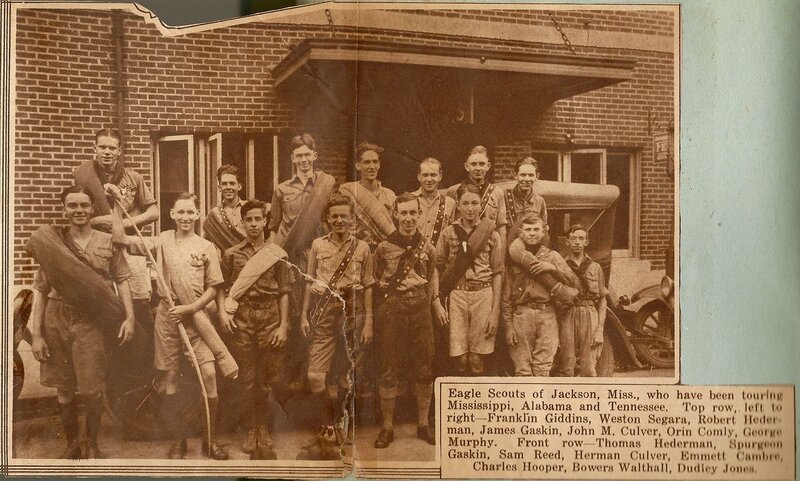 History of Troop 8 – Troop 8 | Jackson, Miss. Begun in 1920, Troop 8 has the distinction of being the longest continuously sponsored troop in Mississippi, and is among the longest in the nation. We have been chartered by First Baptist Jackson since 1921. Grounded in character, leadership, adventure and faith, Troop 8 has awarded over 600 Eagle Scouts. Among all of the Eagles awarded in Troop 8, since the early 1920’s, one has been nationally recognized as a Distinguished Eagle Scout by that National Eagle Scout Association. Spurgeon P. Gaskin earned his Eagle Scout from Troop 8 on January 22, 1925. For more information on the Distinguished Eagle Scout Award, please visit http://www.nesa.org/distinguishedaward.html. If you or a family member is a former member of Troop 8 and have any historical information to share, feel free to contact us at troop8 at gmail dot com.